"The̶n̵ how̴ śhou͝ld Ani͞m ̕and͢ ̸I͢ke̕ ͠begin?̛"
the voice was gone, but if he stopped searching the voice might come back... did any other Sins hear this voice now?... he sure hoped so, then they could do the work. "I'm not sure if I have a book on learning how to speak, perhaps the libary might." unlike the archives there wasn't anything that could teach people magic or other redacted information, so there was a high chance that would be the place to start. Plus on the other hand being around all those books might be a dream to her, and he knows the area around it so if something 'evil but not evil' apears, they could make a quick get away without a fuss rather than cause a scene and fight it. "over this way, not far from the place now. It holds lots and lots of books that you can read, perhaps one or two can help with your learning." he led her down another road and onto a main street past people and carts. Anim was interested, a Library? 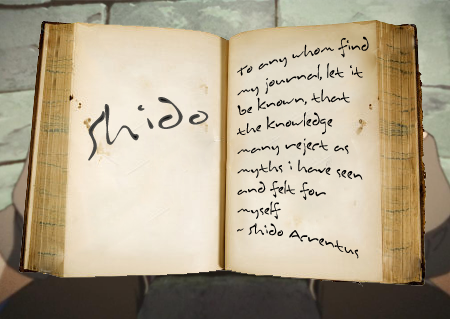 there wasn't anything on a Library in the Mun Shido's book. uh̶hmm͘m̷....̨ Śton̢e b͡l͝oc͜ks҉,͞ bu̴t̢ l͠on̵ger? ͠then,̢ und͞e̶r͠stàndin͠g o̡f kn͜o̶wĺed̨g͘e ̨o̵n ͟g͏ol ̶gol̢g͡a̡àz ̡is ̀gi͞ven. ͏an҉d ͝M͟u̶n͜'s wr͡ite̕ ́w͘it̸h̶ b҉l̡a̡ck w͞a͢ter"
"I've never heard of that method before, sounds interesting. Yes, it's called a book; they're normally written in ink on paper and bond in leather." he wasn't sure how she'd react to learning that paper was from trees, sure she was okay with the whole dead animal leather thing but trees might be different. "So that's the famous book huh, the one that led you here. Shido Acrentus?, I don't think I've heard of him perhaps I'll find out later." Anim nodded, she closed the book and threw it into the air infront of her, it dematerialized. "Wo̢uld M̧u̵n̵ ̧li̵bra̕ry͢ ḱn͏o͢w Şhid̵o? He paused, there was a chance but it was very small. She was searching for a person amoungst others of their race and they would be dead by now, so it's checking both a whole race but the dead of that race as well. He didn't like her chances. "I don't think so, after all you're looking for someone who is dead, a human, and called Shido. If there is somebody who knows, they'll be very difficult to find." He didn't want to give her any fulse hope, finding out anything about this guy is next to impossible, at least without luck, or divine help. Anim nodded... though really she didn't understand why, Elves all had a unique name, that no other elf had. she continued to follow Ike. They finally arrived at the library, it wasn't big or impressive but was the biggest building in the street. "Here we are, should be easy for you to learn a lot here. Just don't go being weird or something in there, I'd rather help you learn than get thrown out or something." He made a light joke to make sure she wasn't nervous, although it would be bad if she was weird, he'd seen enough humans act strangely around things they liked. He walked to the door and held it open for her. "Ladies, Human or Elf first.....I guess." "Mu̶n̷'͜s h̕a̢v͡e ҉a̛ ͞str̡a͘n͞ģè pol͝ic͞y, ͡i̕n Al̵f͡he̡ím Ḿen ̷go̴ bef̛or͡e͠ w͝om͡ęn, ̧the͏n ch̸il͡dr͡en͏"
she entered into the library, and was met with the large scent of the strange flat white squares that humans use, not to mention the animal skin, and black water 'ink', the library had a strange feel... heavy, but to Anim it felt... lighter than outside, and shelves stood tall everywhere, filled with human books, she looked around in awe. ͠maýb̀e͟ A̕n̴i͡m ͜co̴ul͡d ͝mak͘e so҉m̕e?̧"
"And why not?" Aiden huffed, a hint of anger in his voice. The entirety of it was blurry, but he could still remember the things Nexus had said before it all fuzzed out. And while he was willing to leave it alone at the moment, is patience was thin on the matter of him becoming a Knight. He would do it, there was no debate involved whatsoever. He wanted to know what her world was like, it seemed so strange chivalry must not be a thing there. He smiled watching her, she seemed to like it here. "I have no idea what you're talking about, but you might want to calm down you are close to drooling over this place. What have I done, brought a knowledge hungry elf to a place with loads." He laughed and shook his head, watching her in bemusement. Without realising what she was doing, Anim went to the closest shelf, pulled out a book and touched the front cover. to her amusment, the smell of the book smelled like wood, and she was given illustrations of humans, using bent wood into a bow and arrows, and shooting at animals, Anim wondered why they used wood, instead of magic. but she then turned the page. human words were scribbled on here in the same black water 'ink' as the drawings. Nexus turned back to Aiden. "Like I said, you have a very volatile temper that you seem not to be able to control. A knight should possess full control of himself, be it physically or mentally. And also..." He examined Aiden "...I remember the way you charged at that drunkard earlier...you clearly possess very mediocre fighting skills." He watched her before walking around himself, looking for a book that'll help their situation. He hoped she wouldn't cause any trouble but, either way it seems she's having fun. "Hope she finds something to help her learn." she sat down with this book, and seemed to read it several times over. He sat down watching her. He hadn't met many people who liked learning this much, it was odd, but it was nice. He eventually fell into a light sleep, using his own magic to create the gate had drained him. He wondered how she wasn't even a little bit sleepy, but didn't want to ask. she stopped reading the dictionary after the 4th time, and placed it back, then she re-covered her ears behind her hair. she then looked around for Ike. He had fallen asleep at a desk in the library, using so much of his magic was tiring. He hadn't done much magic lately, there wasn't a need to use much. He decided to take a short nap, even though he should be helping Anim. Anim went up to Ike, but he seems to be asleep, Anim squated down, her dress going over her knees and still on the floor, she wondered why he was asleep, was he tired? she lightly touched the tip of his head with her finger. his mana pool was so low.... she considered giving him some of hers, but she would bloat his Mana Pool. sleep, transfers, eating or holding magic artifacts without using them. Anim stood back up, extended her hand, and a strange golden rod materialized, 2 or so people saw this, she placed the right lightly against Ike's head. and waited. He woke up after a little while and yawned. How long had he been asleep? He finally noticed Anim, and almost fell off his chair in shock. Why was she so close?, What was the thing she's holing? So many questions that he could barely get out a sentence. "Wha... Why, huh?" He managed to get at least that out while remaining on his chair getting his balance back. "Ike's mana poool was low, so Anim read a book that Muns can restore Mana by sleep, consumption or magical artifcats"
"Anim's Sky Sceptre is Magical Artifact, so Anim used it to restore Ike's mana.... why's Ike's Mana so low? did Ike change a forest?" she asked, whilst the sceptre begun to fade from the plane of existence. He looked at her confused for a moment before it dawned on him what she meant. She did her best to help him, it seemed to work as well he felt normal, if not more awake than before. "Oh, thanks. I'm sorry I fell asleep on you like that, I should have helped you." He smiled showing he was grateful to her for her help, then he shook his head. "No I didn't change a forest, whatever that means." "Anim didn't word that right? change a forest, like make wood into metal, or change mun green leaves to blue." "Anim is curious, what is there?" "what, use alchemy? I haven't done any lately if that's what you're asking." He was confused at why that would factor in, but he wasn't going to question her. Come to think of it Elf biology might be different to Humans, she could have two hearts or something. "in there? That should be some secure records, not for the public, er..... Many people I guess." At least that's what he heard, but didn't really care to investigate more into it. He sighed then stood up after her. She'd get into trouble if she went in there, or if she got caught at least. Even if she was curious, that didn't mean she could do what she wanted in order to find out. "That might not be a good idea, you'll just get into trouble. We Humans have a saying, 'curiosity killed the cat', it means sometimes being nosey isn't good for your health." He studied her wondering how she'd react to being blocked from her answer. she stopped before stepping onto the first staircase step. "Then, can Ike show Anim more Mun things? such as Mun King?" He let out a small chuckle, he didn't think she'd just stop. He was planning to help her if she wanted to have a look, he was just testing how far she'd go to satisfy her curiosity. "King?, I don't think he'll be out today again. Yeah I'll show you what ever catches your little curious eye." He smiled, it was fun to help someone learn about something they wanted to know. "Oh, the end of the saying. It's 'Curiosity killed the cat, but satisfaction brought it back'. Just thought I'd let you know." "Anim is still curious about the door, but Anim doesn't want Ike to be mad, nor get in trouble.... Anim might come back for it later... oh! before we leave"
Anim quickly moved over to a librarian, and asked them something, they nodded their head, replied something, then Anim went back to Ike and headed once again for the door. "ok, can Anim and Ike come back Tomorrow Morning? He laughed at her, "so she wanted to find out but hesitated for my sake huh." He smiled at the thought but shook his head. "Anim is an interesting person, one who wants to know things yet pauses for the sake of others. Defiantly not like what I heard Elves are like." He nodded at her request to come back in the morning. She'd asked the librarian something, so at least she's getting used to interacting with humans more. "Sure, we'll come back tomorrow. I promise I won't fall asleep on you again this time." "mmm~! then Anim will answer questions Ike has about Elves, Anim memorized Mun dictionary, so Anim knows humans words better!" she re moved her hair to cover her ears again. "I guess I have roughly the same kind of questions you'd ask about humans. You do, that's good." He kinda felt guilty for not helping her and falling asleep, not that he could've helped being tired and drained. He noticed her ears as she hid them again, they didn't look too human but she said they looked more human than the other Elves...... That only made him curious to find out, just like their personalities he had heard about as well. "well, what questions would those be? Anim asked before if this was a Mun city, and Ike responded, it's almost like Elvenl cities, but more golden and white, with tall towers and no stone roads, the tallest tower is where Elf leaders reside." "Mostly just questions on what your world is like, that sort of thing. I can't really imagine it, seems just so odd and weird, no offence." He looked around as they left, trying to imagine what it was like in her world. But his imagination could only go so far, and it was other worldly. "Perhaps one day, we'll find an easier way to travel between the worlds. Then you'll be the one showing me around and teaching me your language." He shook the thoughts from his head, that was just a joke, it'd still be a long time before they found the 'Rainbow bridge' or something like that. "Even if we did, Anim doubts Anim could return to Alfhiem, Leader did say Anim could no longer return, since the gate was one way... but maybe the bridge is different"
Anim pondered for a moment, before her stomach growled. "Anim needs to eat, and now Anim wonders what humans eat"
He thought on that, she wasn't allowed to return? Perhaps because they didn't want any humans from getting there. From a military stand point, other worlds would mean more land and wealth for the taking. It could also destabilise the different governments of the worlds. "You're hungry?, I wonder if you can even eat human food. Your biology could be different from a humans, meaning what's good for us could be deadly to you and visa-versa." He looked at her intrigued. "We could try going to get some different things for you to try, though we'll need to keep an eye on you just in case." "Anim mostly eats herbs, but Anim doubts Muns have same herbs, Anim learned that Muns also eat meat! some elves do too, Anim never tried though"
"Elves can eat Grohiik, kodaav, rikmah, kaviir and hiraak meat, the closest to that for Muns is Wolves, bears, chickens, rabbits and pigs... though Elves only eat meat when their Mana Pools become low, Anim never needs to worry though"
"so just a salad then?, fruit and vegetables." He thought for a moment, wondering if he had anything at home. He doubted it, so he'd have to buy some stuff for her. "Okay then, let's go see what might satisfy your hunger." "Mun Salad? Anim hasn't read about Mun Salads, Anim knows Mun's have many types of food, what's a Salad?" He thought, normally people knew what a salad as thus didn't ask. It never crossd his mind that he'd have to describe it to someone. He looked puzzled and confused trying to think of how to describe it. "Erm.... I guess it would be a mixture of different fruit and vegetables, it's said to be healthy and good for people who don't eat meat. That was the best he could think of to describe it. "hmm, Anim then has eaten Elf 'Saahlaad' before, but not Mun Salads... Does Mun's have different biology than Elves? what organs does Ike have?" she asked, sort of pressing where a 'stomach' would be on her body if she was human. "Anim didn't find a Mun Biology Book in Mun Library"
He paused, he thought they might have different biology but didn't think it would be that bad. She might be missing things like a heart or lungs, even a stomach. "I'll have to find you a book on it, that's the only way to really try and explain.....other than cutting me open." He laughed that off as a joke, hoping she didn't take him seriously. "If we cut you open, we'll have to do equal exchange, so cut me open too"
she giggled at her own joke too. Anim then noticed her hair had slightly moved from her ears, so she moved her hair to cover them again. "Sorry I'm not good with blood, so I'm just going to pass on all the cutting open." Although he did wonder how different see really was, but he wasn't going to cut her open. So he just laughed as well and noticed he hiding her ears away again. "Sorry that you have to hide your ears, I know it must be annoying but I'm not sure how other humans would react to an Elf." "Anim is ok with hiding ears, Anim doesn't want to cause Ike trouble, it might also scare or anger other muns if Anim is exposed, Anim read some Mun books on fairy tales, Fahliil is a Mun Fairy Tale, so muns might not react well to one fairy tale being real"
He nodded, understanding her point. She was right, though how he'd just accepted it was weird as well but not a problem. "Yeah, you're right." As for he second question he had to think, he could guess where normal humans ate but he mostly just kept to himself. "They eat anywhere, outside for picnics or inside places like tavern or their own homes." "Fahliil eat outside together, Anim eats in tree tops with reyth piit ulfah and lokraans, the closest to Lokraans in Mun World are Mun Birds. Mun World has many creatures like Fahliil World, though Fahliil seems to have some more than Muns"
Garry then turned off his ears, since he was sloth he could willingly do that. though an elf being in this world was interesting.... he decided to tail them for a bit, to decide whether this 'elf' was actually a threat or not. He stopped and looked at her. "I'm pretty sure you're now just making up words with random letters." He looked confused at all the words she had said, some parts he understood but other bits were lost on him. "reyth piit ulfah Anim cannot translate to Mun language, but they're creatures in Anim's world, they live in forest tops and skies, but not look like Mun Birds, Lokraans look like Mun Birds"